Bird nerds unite! Before moving near woodlands, I foolishly believed that birdwatching was a pastime reserved for enchanting older women with spectacles, knitting needles, rocking chairs and endless wisdom. But this hobby can inspire ANYone who appreciates the benefit of patient observation. Really. Come on! We can learn a lot about survival of the fittest from observing the behaviors of other creatures. Plus, birds are just cool! Over the past 6 years, it seems I can't get enough of my feathered friends. Those birdies know what's up out here, too. The human in THAT house is on their team. Oh yeah- I feed em', I chase the squirrels away, I leave out fresh water. Those birds gossip, too. I know they do. They've told all their pals that it's Happy Hour at our house all. day. long. Yup. We've got the binoculars and bird identification books all laid out in the house, ready to spy and research new visitors. But for awhile there, the squirrels were stealing all the goods! We made countless attempts to shoo them away and experimented with different bird feeders to no avail. Finally, after my typical research marathon, I found the solution! 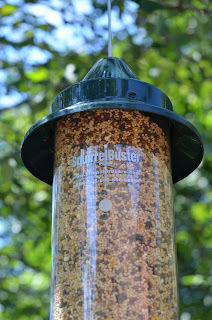 The Brome Bird Care Squirrel Buster Plus saves the day! *For the record, I'm not getting paid to write about any of the purchases I review. 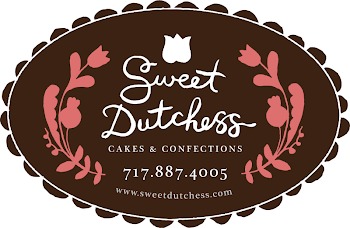 When I'm forking out the dough for any product, I have high expectations. If I find something that works well for the price, I'm happy to share my experience. It didn't take long for the action to start. The squirrels, who had been waiting for their typical handouts, popped their ravenous black eyes out within a few minutes. Immediately, they pounced onto the new feeder and tried to get at the goods. BOOYAH!!! The weight of the squirrels' bodies caused the feeder to close, locking those theivin' devils OUT! Thwarted, suckas! When squirrels land on the Brome Bird Care Squirrel Buster Plus, the weight of their bodies causes the food openings to shut tight, preventing access. And that's it! They're outta here. I can only guess that word spreads fast through the squirrel grapevine as well, because shamed in utter defeat, those mangy little rascals don't even bother to come around anymore. They've likely found some other sap who's unwillingly dropping mad cash to feed their fuzzy faces. Peace out, rodents! Now, without the distraction of the stinkin' squirrels, we've made our birds quite a spa! After reading about the benefits of adding a bird bath to our property, we dove in and purchased Hayes Hammered Copper Bird Bath. This feature has lured in loads of new visitors who enjoy the luxury of a cool drink or rinse. It's so fun to watch them take turns flappin' their feathers in the water! 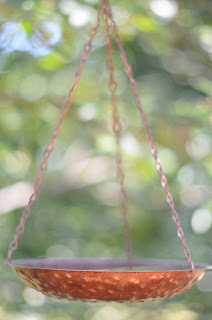 Hayes Hammered Copper Bird Bath draws in lots of new birds for refreshment. The icing on the cake? Suet, of course. 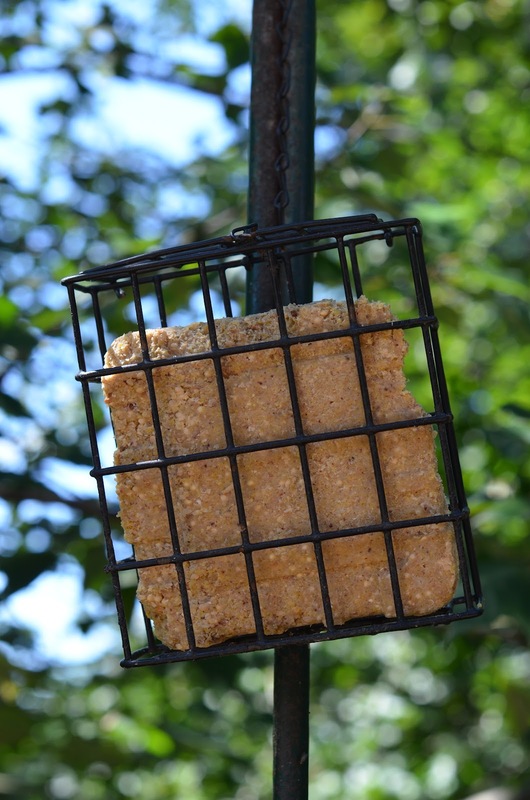 We stock up on Heath suet packs all year round to bait the birdies. They LOVE this stuff, chomping down at least one a week. Because the suet is such a hot commodity at the Bird Spa, we often buy in bulk, either at our local Ace hardware store or through Amazon. 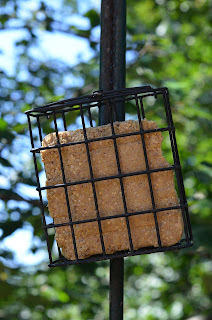 Suet works wonders to beckon the birds. So there you have it. 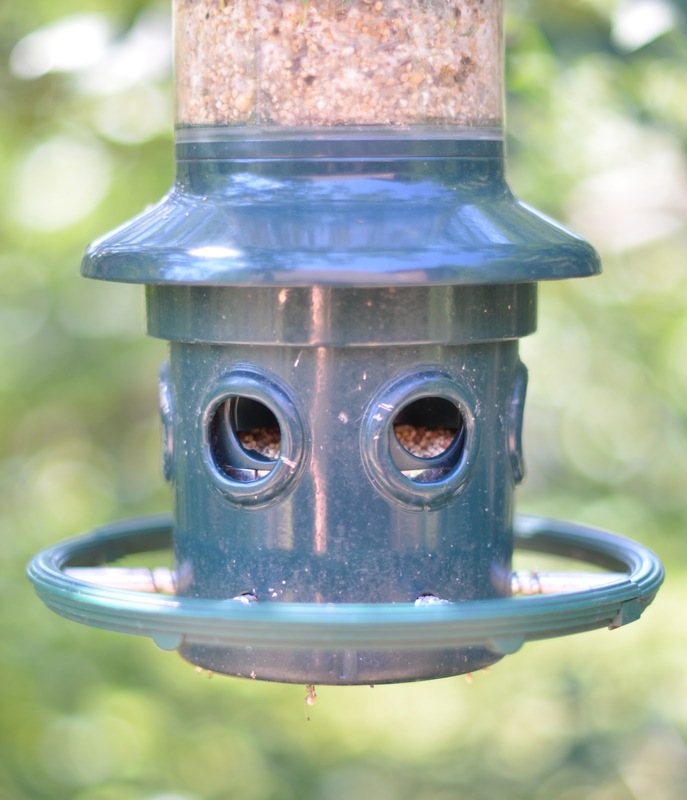 We've created a simple, inexpensive haven for our avian friends. Our family is so captivated by observing the fascinating behaviors of these beautiful creatures. There's just so much to learn- from basic identification to song recognition and social mannerisms. We just love it all. All set up and ready. The Spa is OPEN! Never paid much attention to the birds who fill the afternoon with song? Hmmm. I suppose we've all noticed them after we've parked under a tree housing a family of pigeons who've just consumed a mulberry lunch. But there's more to learn. So much more.